The Chicago White Sox head into the offseason with a lot on their plate. Following another bad season on the field in the majors, the Sox need to make some major upgrades to their roster if they're going to be more competitive in 2019. The Chicago White Sox head into the offseason with a lot on their plate. Following another bad season on the field in the majors, the Sox need to make some major upgrades to their roster if they're going to be more competitive in 2019. Specifically, they need a better offense, deeper starting pitching, and some bullpen arms. Easy peasy, right? The good news is that the White Sox have a great one-two punch for fixing a roster: Great young prospects and payroll flexibility. Chicago has just $14.3 million committed to the 2019 payroll prior to figuring in arbitration raises and pre-arb salaries, and there's a good chance that only one player currently on the roster is set to break the $10 million barrier in arbitration next year. Suffice it to say, the Sox have flexibility. And with some great young talent on the way soon, we could be seeing a legit World Series contender as early as 2020 if they play their cards right. But let's slow down and take one step at a time. First, let's examine what the White Sox need to do this offseason and how they might look to fill out their roster. ## Rotation Reynaldo Lopez and Carlos Rodon. Those are the only two guys that you can definitively project as starting pitchers for the 2019 White Sox at this moment. But that doesn't mean the Sox don't have pitching on the way. Lucas Giolito started 32 games in 2018 and posted a 6.13 ERA, but he's a 24-year-old former top prospect so he'll be given a chance at a rotation job next year. The same could be said for Dylan Covey – about having a chance at a job, not being a former top prospect. The future of the White Sox rotation is in Michael Kopech, who will miss all or nearly all of the 2019 season following Tommy John surgery, and other prospects such as Dylan Cease and Dane Dunning. Thinking ahead to 2020, Lopez, Rodon, Cease, either Dunning or Giolito, and a healthy Kopech could be one of the best 1-through-5's in the game. However, that's still a year off. For now, general manager Rick Hahn needs to figure out how to fill in the innings for next season. Giolito, Covey, and the perpetually disappointing Carson Fulmer will all get a shot, but expect that Hahn will want to find better depth than two solid starters (Lopez and Rodon) and three struggling kids. On the free agent market, there is James Shields – who threw 204 1/3 innings for Chicago last year with a 4.53 ERA – and a host of others, ranging from legitimate ace's to quality inning eaters. Dallas Keuchel, Patrick Corbin and Nathan Eovaldi are out there, but I wouldn't expect the Sox to spend that kind of money on starters with all the pitching prospects they have in the high minors. Guys like Shields, Lance Lynn, Gio Gonzalez, or even J.A. Happ could be targets. ## Bullpen Joakim Soria had an impressive season with the Sox in 2018, posting a 2.56 ERA and 16 saves in 19 chances over 38 2/3 innings. But they traded him to the Milwaukee Brewers at mid-season, and most of what was left on the roster wasn't all that good. Xavier Cedeño had a nice season as a left-hander out of the 'pen, but he was also sent to Milwaukee in a later deal. Luis Avilán, another lefty, was sent to the Philadelphia Phillies in an August deal. Going into next season, the White Sox need some serious bullpen help. For now, let's look at what they do have. Left-hander Jace Fry is just 25 years old and struck out 12.3 batters per nine innings last year, Juan Minaya had a solid year for Chicago despite way too many walks (5.6 per nine), and the oft-injured Nate Jones managed to pitch 30 2/3 innings with a 3.00 ERA. Beyond those three, the Sox have a few more kids that will be looking for a tryout in the 'pen. Ian Hamilton, a 23-year-old prospect, threw just eight innings in the big leagues but had a 1.74 ERA with 10.8 K/9 over 51 2/3 innings in the minors. Aaron Bummer, José Ruiz, and hey, even Matt Davidson could get an opportunity to pitch in relief next season. As far as free agency goes, there are plenty of arms out there and the Sox have money to burn. Craig Kimbrel, Kelvin Herrera, Jeurys Familia, and Zach Britton are a handful of elite names, but Adam Ottavino, Cody Allen, Andrew Miller, and former White Sox closer David Robertson will also be commanding big offers. If you keep going down the list of veteran names, you'll end up with Justin Wilson, Joe Kelly, Bud Norris, and plenty more. The White Sox will target a few free agents in the bullpen department, and ultimately they'll rely on a mixture of veterans and kids to solve the equation next year. ## Position Players This is where the Sox have arguably the biggest deficit between a team that's rebuilding and a 90-plus game winner. José Abreu wasn't traded last year, so he'll return in his final year of arbitration at the age of 32. The Sox really value the kind of veteran leadership that Abreu brings, as well as his mentoring of fellow Cuban Yoán Moncada. He might only stick around until the trade deadline, but there's a chance the Sox lock Abreu up for a few more years too. Otherwise, most of what the White Sox have graduated to the big leagues on offense has been painfully mediocre. The team was 12th in the American League in runs scored in 2018, 10th in home runs (despite playing their home games inside one of the most homer-friendly parks in the game), and 13th in on-base percentage. The 2019 season will be a good test for Avisaíl García to see if his breakout in 2017 is the exception or the rule, and Davidson will likely stick around if he's providing that sweet two-way player value at the plate and on the mound. But the rest is kind of painful. Everywhere you look, as far as the eye can see, it's White Sox batters with OPS's under .700. Daniel Palka had a nice rookie season with 27 home runs, and he might have a role with future iterations of this team as a power bat on the bench. However, it's hard to envision more than just a handful of guys from the 2018 offense having a major role on the South Side's next World Series contender. Hahn knows this, and it's why he's ready to pull out all the stops for Bryce Harper and/or Manny Machado. The Sox were apparently busted out on Twitter for filming their free agent pitch to Harper at the United Center, including an LED banner featuring Harper's name and jersey number next to a White Sox logo. 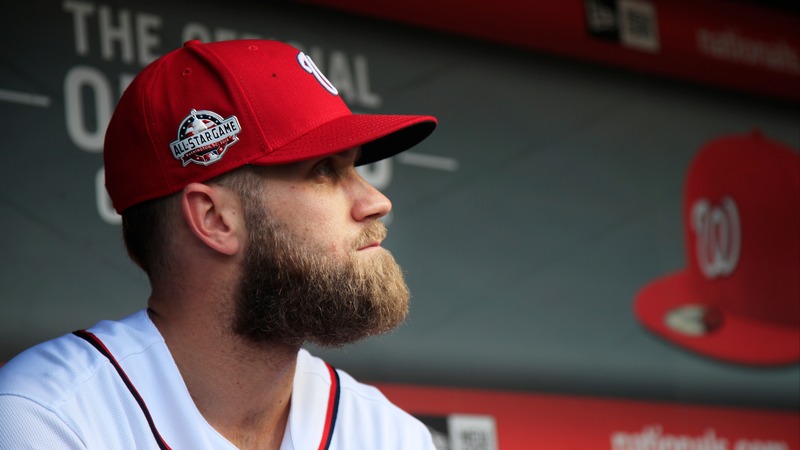 The Washington Nationals outfielder is the big prize in free agency, and rumor has it he already turned down a 10-year, $300 million deal to remain in Washington, D.C. Will team owner Jerry Reinsdorf approve the kind of contract that it would cost to bring Harper to the rebuilding Sox? That's hard to see happening, even if the team has no real long-term payroll obligations to speak of. Front-loading a contract could actually make sense, given how Chicago projects to have some young players getting close to free agency about six or seven years from now. However, USA Today writer Bob Nightengale believes that Harper is a virtual lock to end up with the Phillies. Machado certainly wouldn't be a bad silver medal for Hahn and the Sox, with the 26-year-old shortstop/third baseman seemingly being built to hit at Guaranteed Rate Field. He has averaged 36 home runs per season over the last four years while staying remarkably healthy and playing no less than 156 games. The guess here is that the White Sox get aggressive in their pursuit of Machado, who many believe will ultimately land with the New York Yankees. If that's the case, the Sox could turn to the trade market or secondary free agents such as Josh Donaldson, A.J. Pollock, or Andrew McCutchen. ## Prospects The White Sox have lots of good prospects. In addition to the continued development of Moncada, Palka, Tim Anderson, and all the previously mentioned pitchers at the big league level, there are a handful of others that you should keep your eye on. The biggest name is Eloy Jimenez, who was acquired from the Cubs in the José Quintana deal. Jimenez is a top-five prospect in all of baseball, and in 456 plate appearances between Double-A and Triple-A last year he hit .337/.384/.577 with 22 home runs. If it weren't for service time manipulation, Jimenez likely would've been in the big leagues with the Sox while the team had oh-so-many injuries to position players down the stretch. But while playing out a 62-100 season and at least one more non-contending season on the horizon, Hahn would've been foolish to start Jimenez's clock in the majors. It'll be hard to keep him down this year, although the White Sox will probably try. Expect that Jimenez starts the season in Triple-A but makes it to the majors within a manner of weeks, allowing Chicago to stave off his eventual free agency by an extra year. After all, more money for Reinsdorf is the ultimate goal, right? Cease, who will be 23 in 2019, could be in line to make his big league debut as well. He has yet to pitch above Double-A, but posted a sparkling 1.72 ERA in 52 1/3 innings there last year. The hard-throwing right-hander should join Jimenez in Triple-A to start the year and might get a look in the rotation at mid-season. Dunning is yet another pitcher that's high on the prospect lists, and he too should be at Triple-A and knocking on the door to the big leagues this season. Other guys to watch include catcher Zack Collins, pitcher Jordan Stephens, and former top-100 pitching prospect Spencer Adams. Outfielders Luis Robert and Blake Rutherford, as well as 2018 first-round pick Nick Madrigal, are likely still another year away at best.